Soups are served daily and can be repetitive for residents. 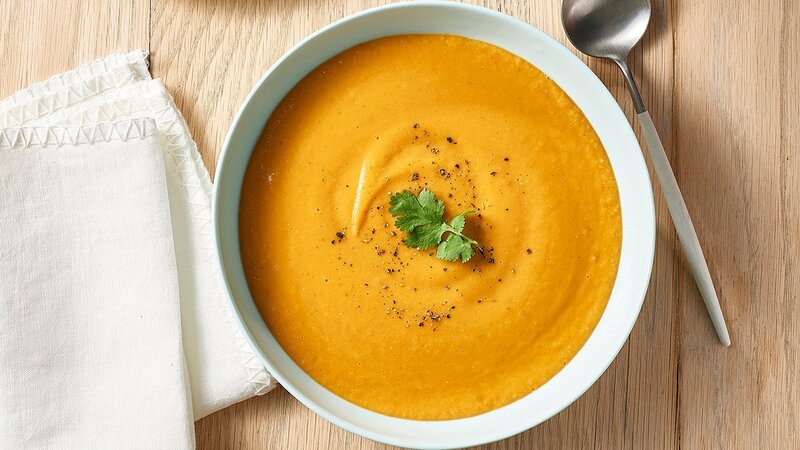 This mild, yet full flavoured soup not only provides great nutrients but is also delicious. In a large stock pot, sauté the red onion, KNORR Professional Garlic Puree in the olive oil for 5 minutes, until the onions are translucent and soft. Add the KNORR Patak's Mild Curry Paste, carrots, capsicum, and sweet potatoes. Sauté for 5 to 10 minutes, until the carrots and capsicum are tender. Mix the KNORR Coconut Milk Powder and warm water together, to create a coconut milk. Set aside. Add the coconut milk, KNORR Vegetable Booster, water and lentils and simmer, covered, until the lentils are done and the sweet potatoes are tender, about 45 minutes. Stir in KNORR Potato Flake GF. Add the KNORR Lime powder and coriander, and stir to combine. Add salt and pepper to taste. Take a stick blender and blitz until smooth. Adjust thickness by adding warm water (too thin if needed) and serve.